“Sit Down!” is another all purpose game. Kids stand in a big circle. One student is “it” in the middle with a pointer (or just his finger). “It” gets to decide what number we start counting on to count by 10s. He might pick 7. So “It” starts pointing at one child at a time as the whole class counts by tens starting at 7. So we count 7, 17 27, 37, 47, 57, 67, 77, 87, 97 and if you are the student pointed to when it is over 100, you “SIT DOWN”. 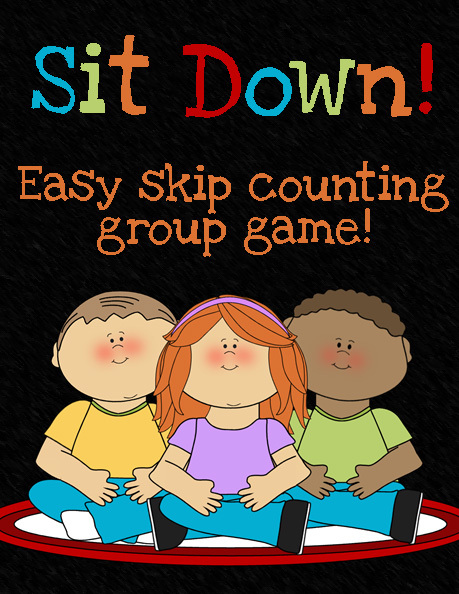 The whole class says “SIT DOWN” and then the game continues, starting with 7, 17 and so on until you again reach 100 and SIT DOWN. When a student sits down, they just sit in their place in the circle and they continue to help the class count. You do this until the whole class is sitting with just one per son standing. Then the last one down is “It” and you start again. “It” picks a new number to start with and you keep going. This game could be down with numerous concepts (like saying the alphabet, state names, etc. ), or skip counting by any number (not just 10). Kids especially like it if teacher plays and has to sit down too. This entry was posted in Games, Math, Math Games and tagged Children, Education, Elementary School, Games, Homeschool, Kids, Math, math games, skip counting, Teacher Resources, Teachers, Teaching by Squarehead Teachers. Bookmark the permalink.